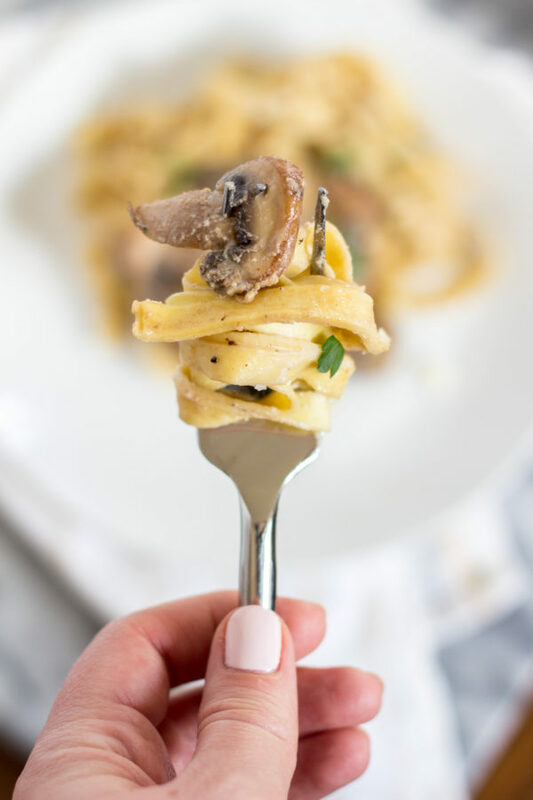 This super quick and easy recipe for 10 Minute Mushroom Goat Cheese Pasta is a comfort food meal that can turn your night around. After a long day of work – especially a Monday – who wants to go through the effort of cooking dinner? 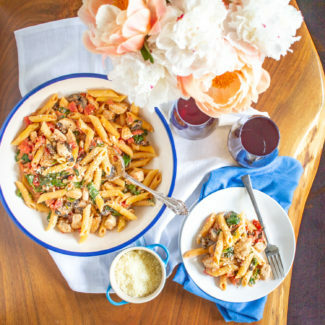 In the spirit of saving time, and making weekdays easier, I have created a 10 Minute Mushroom Goat Cheese Pasta recipe. It’s perfect for those of you who participate in meatless Mondays, or for anyone who wants spend less time in the kitchen and more time relaxing. 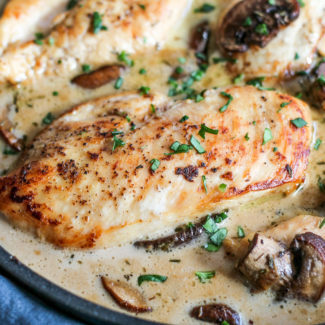 Mushrooms are the star of this meal. 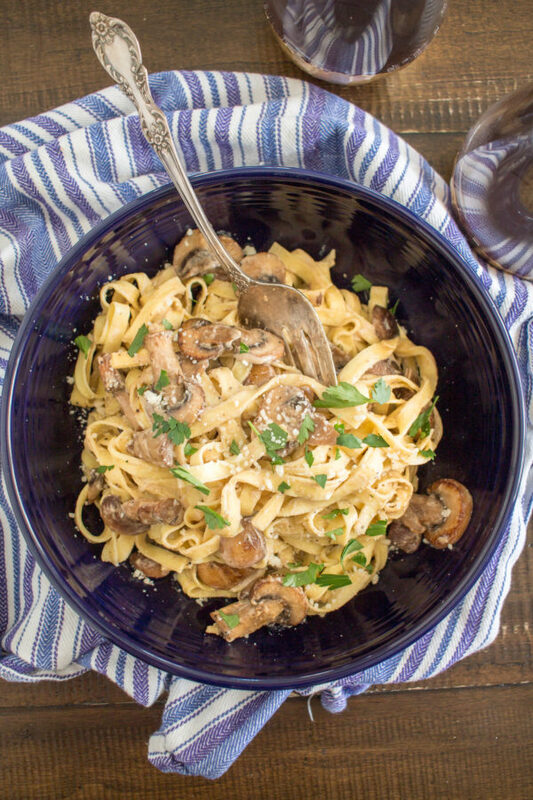 They are so meaty that even my carnivorous husband is satisfied, and these mushrooms are full of flavor from being sautéed in butter and sherry. This is a vegetarian meal that is just as filling as a meal that involves meat. 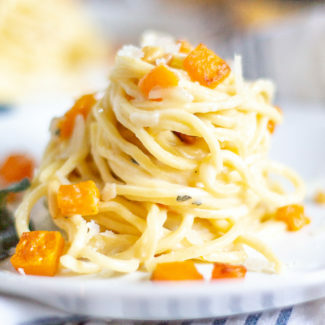 I enjoy simple rustic pastas that combine a few ingredients that I really love. So on top of the fact that this meal can be prepared in just 10 minutes, you only need 7 ingredients (not including water, salt, and pepper). 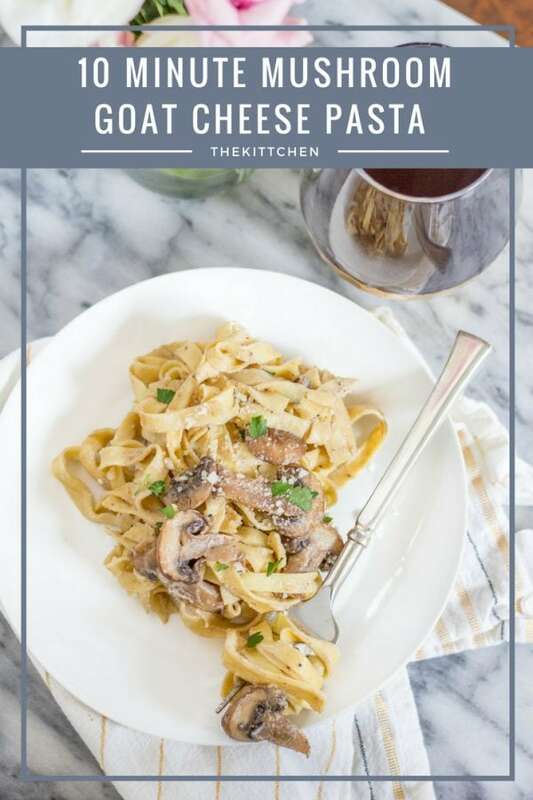 The light creamy sauce is made with the sautéed mushrooms, a bit of sherry that you let reduce in the pan, a touch of cream, a hint of pecorino, and is finished with pasta water. Starchy pasta water helps bind the sauce to the pasta. 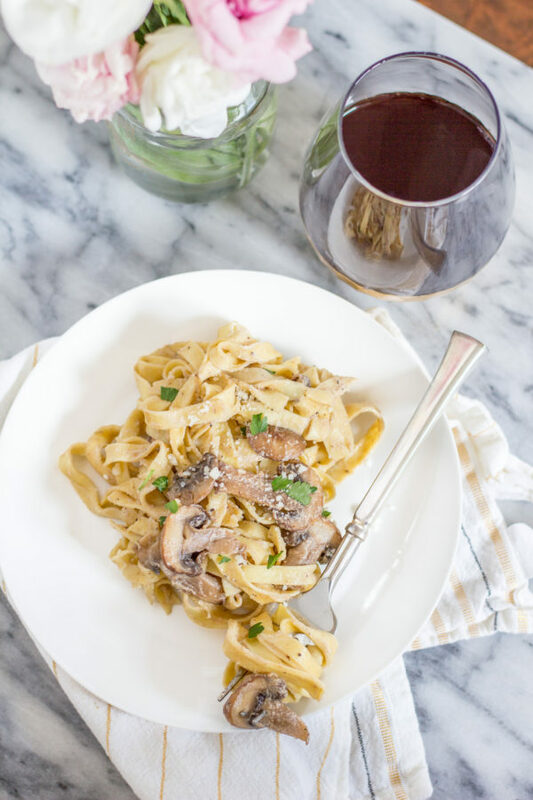 If you have never sautéed mushrooms in sherry before, you are in for a treat. 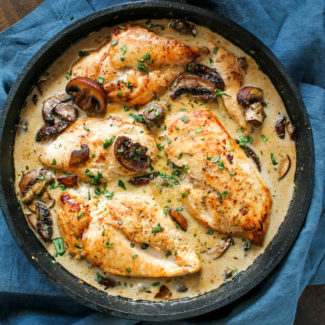 The scent of mushrooms simmering in sherry is just as delightful as the taste of the mushrooms. Trader Joe’s has a frozen pasta dish which is similar, but it takes almost the same amount of preparation time, and it isn’t as creamy. 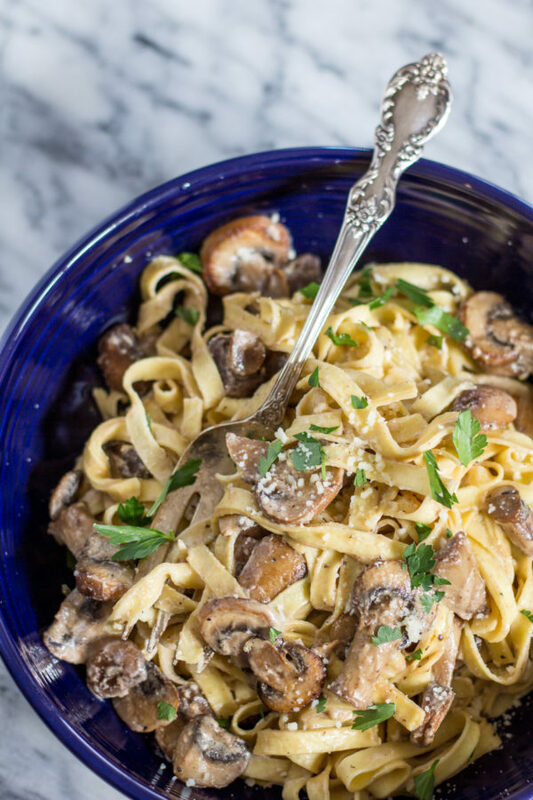 Making this Mushroom Goat Cheese Pasta from scratch is worth the small amount of extra effort. If you want to add some extra protein to complete the meal, you can add a breaded chicken breast on top. And if you want extra veggies, add in some asparagus – chop it up and cook it right in the sauce. Start off by bringing a pot of water to a boil. While you wait for the water to boil, melt the butter in a skillet over medium heat. Add the mushrooms, tossing them around in the butter with a spatula so that they become evenly coated in the butter. Season with a dash of salt and pepper. Sauté the mushrooms for 3 minutes on medium low heat. Then add the sherry. 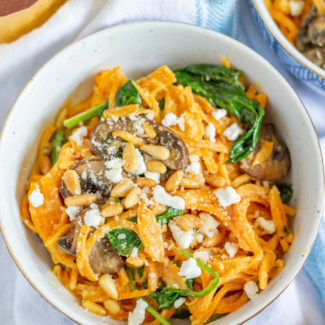 Once the mushrooms have absorbed half of the sherry, add the goat cheese, and stir until it melts and is evenly incorporated into the sherry creating a sauce. Stir in the cream and let slowly simmer on low. Cook the pasta for 2-3 minutes, or for the length of time specified on the packaging. Before you drain the pasta, remove 1 tablespoon of the water from the pot, and add it to the sauce. 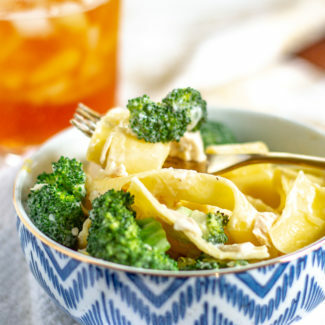 Drain the pasta, stir the pasta water and the pecorino into the sauce, and then add the pasta tossing it in the sauce until it is evenly coated. Plate and serve immediately.